Auto Focus presents the launching events of the country's automobile brands. Suzuki Philippines is elevating their 4x4 game by bringing in the all-new Suzuki Jimny All-Grip Pro to the market. In this week's Special Feature, it's all about the fourth generation model. Watch this. Suzuki Philippines made waves in the local auto industry when they finally unveiled the much-anticipated all-new Jimny All-Grip Pro held at the BGC Amphitheater. With its simple, rugged design, and powerful engine, Suzuki Philippines said the fourth-generation Jimny is designed to deliver an authentic 4x4 experience. Under the hood of the all-new Jimny is a 1.5-liter, 4-cylinder K15B engine that delivers stronger torque at all rpm than its predecessor. It is also equipped with Suzuki's Total Effective Control Technology which scatters collision energy across the vehicle frame to mitigate damage to the car and passengers. When it comes to its design, the all-new Jimny sports a square form with compact dimensions, allowing the SUV to maneuver through narrow mountain trails and terrain. The angled bumper is optimized for off-road terrain while the square wheel arches allow for easier tire changes. Meanwhile, the headlamps, which are inherited from past models, are separated for independent replacement. The interior of the Jimny is simple and straightforward-the same with its exterior design. The cabin is filled with functional parts such as center switches and dials. The instrument panel and surrounding parts are equipped with scratch-and-stain-resistant grained finish while the steering wheel is wrapped in leather. The infotainment system of the Jimny comes with a 9-inch touchscreen with off-line GPS navigation and off-road audio guide. 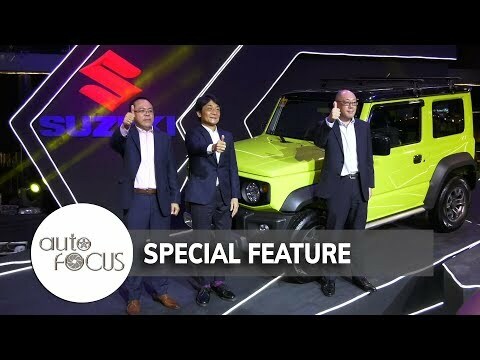 From its exterior to interior design and down to the smallest details, Suzuki said that the all-new Jimny All-Grip Pro reflects their commitment to continuously provide innovation that their Filipino customers can rely on. With the arrival of the all-new Jimny All-Grip Pro, Suzuki Philippines aims to continuously provide innovation that their Filipino customers can rely on. It's a wrap for our Special Feature this week, we hope you enjoyed.